You may not know this, but for years I’ve posted some of our family’s favorite recipes over on Life as Mom. Since I also post recipes here, sometimes it’s hard to keep track of them. This one? This one you need to know about. This pie is what I call the Lazy Woman’s Pie. You don’t need to roll out a fancy crust. You don’t need to arrange the apple slices in fancy patterns. You don’t need to make a pretty top crust. What you do need to make is a double batch! I promise you that you will not have leftovers, though you will wish you did. This pie has a thick, buttery crust, a sweet cinnamon-scented apple filling, and a crunchy crumb top. Now that apples are in season, it’s a good idea to make several of these to stash in the freezer for whenever you want a yummy, home baked pie. 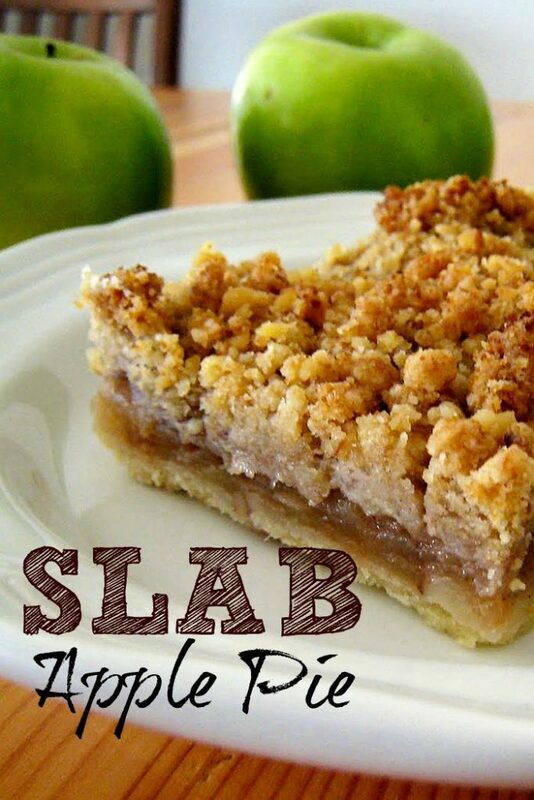 GRAB THE RECIPE FOR SLAB APPLE PIE HERE. I do love this, but I’m the only one since the kid is not a fan of fruit. (seriously, what’s wrong with him?) I don’t MIND eating the whole thing, but I do have to be careful not to make it too often or I’ll end up as round as an apple! This is absolutely one of my most favorite recipes of yours. I make 3-6 of these every fall and freeze them for use through the winter. I also make them in the little jars to pull out once in awhile for a treat. SO good. Thanks for sharing, Jessica! The jars are a great idea. I wonder if I’d have to share. Ha! Ha! I told my husband I made this for him. And I did. And then I tasted it. Oh my gosh. the crust ingredients didn’t look like they’d spread over a 9×13 – do they really? I wanted to make 2 smaller pans anyway so I used a little over half for a 9″ square and then the rest in a slightly smaller casserole dish. I used 3 apples in the 9″ and a large Mutsu in the smaller casserole. They were done in about 40 minutes. There’s a knack to getting the dough all the way across. When I’m feeling indulgent I make a double batch with really thick bottom crust. Glad you liked it!